But it doesn’t seem to have the meaning of a remote conditional. Whereas If he were sorry implies that he’s not sorry, if the second-grade children did not have African American attire doesn’t imply that they actually do have it. It seems to be an open conditional: if they have it, they wear it; if not, they dress as safari animals. So where does it fit in? When Glen and I were kids, for a couple of years our family would read aloud from novels after supper. I remember we did a few that you’ve probably never heard of, plus a Hardy Boys mystery and Johnny Tremain. But by the time we hit junior high school, the habit had kind of fizzled out, which was too bad. As regular readers know, we do a lot of reading aloud here, from Dr. Seuss and books about barnyard animals when they were in preschool, to Henry Huggins, Harry Potter, and other YA stuff when they were older. Now that Doug and Adam are teenagers, I can at least say that I’ve maintained the tradition for longer than it lasted from my childhood. And now I can read them R-rated stuff that I could never have read them a few years ago–for example, our current selection: Flashman and the Redskins. If the Apaches had posted sentries, I suppose they had been dealt with. . . .
What was the big deal? Well, a few years ago I wrote this post about conditional sentences. Following the Cambridge Grammar of the English Language, I divided them into open conditionals (describing situations that might actually happen in the future, or may have happened in the past), and remote conditionals (describing situations that are unlikely to happen, or probably did not happen). Also following CGEL, the past tense can show actual past time (see the bottom left corner), or remoteness in the present or future time (see the top right corner). What it can’t do (at least in Standard English) is show both past time and remoteness simultaneously. For that, you need the past perfect tense. This is what you get in the dark green, bottom left corner: If he had been sorry, he would have apologized. In my diagram, that’s the only place the past perfect tense appears. Back in those days, Doug liked to go out and ride his bike at every opportunity. I was coming home from work and wondered if he would be home. I knew that if he had finished his homework, then he had certainly already left the house. But the plane dispatched to the position of another smaller blip found nothing. If there had been a lifeboat, it had sunk. What happened in school if you hadn’t read the previous night’s assignment? You most likely had nothing to say. And now to finish with a more typical conditional with a past perfect tense: If I hadn’t been thinking about open conditionals, I wouldn’t have noticed anything interesting about these three examples! In an issue of Entertainment Weekly a few weeks ago, I read an article about Sara Bareilles, a name I recognized from a music video that used to play on the overhead TVs at the gym, back when I used to go to the gym. The song was called “King of Anything,” and aside from having a good hook, it piqued my interest with the mismatch between its title and its lyrics. The title suggested “free-choice anything,” as in “I can do anything I want!” But in the song, it turns up in a line in the chorus: “Who made you king of anything?” Bait and switch! This is negative polarity anything! I even considered blogging about it at the time, but never got around to it. However, this article wasn’t about “King of Anything.” It was about “Brave,” a song Bareilles released last year, and which was nominated for a Grammy. I found it, listened to it, and bought it. Not only is it a great tune with inspiring lyrics, but as a bonus, there is linguistic commentary to be made on it. to a weapon or a drug. Show me how big your brave is! I want to see you be brave! The way Bareilles does it, you get the repetition of say at the beginning and end of the line. It’s easier to put emphasis on say, with its open syllable, than on the closed syllable said. Honestly, I want to see you be brave! Both parses make sense. The song is about telling the truth, so you could easily take honestly as a manner adverb to modify let the words fall out. However, honestly also works as a sentential adverb, like frankly or seriously, so the second parse works, too. In fact, this is the first squinting ambiguity I’ve seen in which the adverb works as both a manner adverb and a sentential adverb. So which one is it? You don’t get a clue from timing, because in the song there’s a pause both before and after honestly. Of the few written versions of the lyrics that I looked up, most don’t have punctuation there, but they do break the lines so that honestly goes with I want to see you be brave, so I suspect they’re going with the sentential-adverb parse. But honestly, I think the manner-adverb parse is better. Maybe Rocco had some kind of idea that an atheist Jew would be something like a fasting carnivore, or a celibate homosexual (or heterosexual or bisexual), and hadn’t quite grasped the concept of criterial definitions. Or maybe he was thinking of Jew in a more cultural sense, like I just read about in this Wikipedia article. Whatever he had in mind, Doug and Adam weren’t buying it. Adam tried to explain Rocco’s argument, not very satisfactorily, but that was because of the material he had to work with. He and Doug were laughing as they tried to dissect Rocco’s reasoning. Well, you can’t say “if and only if” to a semanticist and expect it to pass unexamined. “So … Muslims are Jews?” I asked. Later on, I drew a truth table for if and one for only if, and showed them to Doug. He found that, after all, he and I agreed about the meaning of only if. So what’s the difference between only if and if and only if, I asked. “I don’t think there is one,” Doug said. I drew up the table for if and only if, and Doug understood it, but in his opinion, in ordinary conversation, if and only if was just an emphatic way of saying “only if”. “I’m with Doug on this one,” my wife offered. In a casual, dinner-table conversation, I shouldn’t have taken Doug’s if and only if in this technical sense. Technical sense? This was my first inkling that there was more than one sense! Republicans in the house are embarking on their own effort, promising to cut spending and raise the debt ceiling if and only if both Houses of Congress vote for a balanced budget amendment in the coming days. we may have now a normative principle that that action is legitimate if and only if it proceeds on this model through the U.N.
What do you think? Have you used, or heard others use, if and only if to mean only if? Back when Doug was in preschool, we took him to the doctor one day for a rash on his face and chest. The diagnosis: fifth disease. Fifth disease? What the hell was that? After Googling it, I learned that another name was slapped cheek syndrome, which made more sense. I didn’t object so much to a disease being called fifth disease, except that that was the only disease I’d come across with a numeric designation. Why hadn’t I ever heard of the first four diseases, or the diseases from the sixth onward? As it turns out, diseases 1-4 go by the names measles, rubella, scarlet fever, and Duke’s disease, while the sixth is more commonly known as roseola. Furthermore, these numbers don’t encompass all diseases; just childhood diseases that involve rashes. That’s a little better, I guess, but why is it only the childhood rash diseases that got named this way? It reminded me of comics in the newspaper that do occasional running-gag strips on a theme like “Signs You’re the Parent of a Teenager” or “Essential Activities of Summer”, and each strip is labeled with a number. They don’t start with one and go sequentially; they label each entry with a randomly chosen number, as if to say, “The list goes on and on.” Ads in glossy magazines do this, too. I’ve … noticed that 80% or more of Americans don’t use the past perfect form of verbs when the other clause in the sentence is a third conditional. They use the simple past form instead. I find myself doing it when I speak fast. For example, talking about a party which has finished: “If I knew you were there, I would have said hello” instead of using “had known”. Do other English speakers in other countries do the same thing? “Third conditional”? This kind of conditional sentence is what I think of as a past-time counterfactual. Actually, I’m now moving to the terminology of the Cambridge Grammar of the English Language, and will refer to these as past-time remote conditionals. Remote refers to the falseness, or at least unlikelihood, of the situation described in the if clause. “If I had known you were there” — but I didn’t know. Anyway, this is the second or third time a commenter has used the term third conditional on me, so now I was finally curious enough to try to find out where this term came from, and what first and second conditionals might be. I still don’t know where it came from; the earliest I’ve found in Google Books is in an 1822 grammar of Spanish. However, I can now tell you that a first conditional is a present- or future-time open conditional. For example, If you’re happy and you know it, clap your hands, or If you touch my stuff, I’ll kill you. It’s an open question whether you are knowingly happy, or whether you’ll touch my stuff. Maybe you are, or will; maybe you aren’t, or won’t. A second conditional is a present- or future-time remote conditional, such as If you really loved me, you’d do it, or If I won the lottery, I’d quit my job. The implication is that you don’t really love me, and winning the lottery is unlikely. The third conditional, of course, is the past-time remote conditional. I got all this from an online grammar reference from Capital Community College of Hartford, Connecticut. Now that I know about first, second, and third conditionals, though, not only do I still think the names are poorly chosen and uninformative, but they also miss a fourth possibility: past-time open conditionals. I’ve laid them all out in the table below, and you can verify that the bottom left corner is the one that got left out in the cold. It’s the Rodney Dangerfield of conditionals. Not because it has bulging eyes, starred in movies such as Back to School and Caddyshack, and does standup comedy with lots of one-liners, but because it gets no respect. But you probably figured that out. 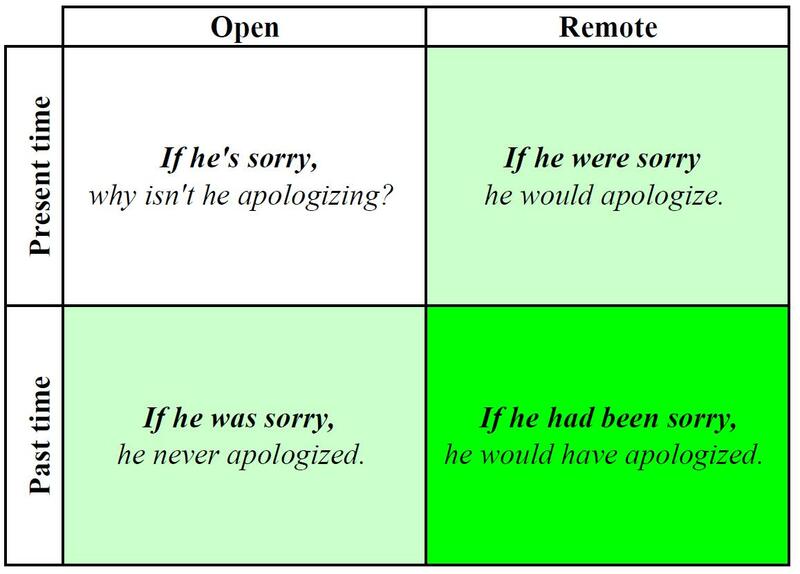 What’s interesting about present-time remote conditionals and past-time open conditionals (the light green squares) is that they both use a past tense verb form: If he was/were sorry in the examples. CGEL looks at it this way: The past tense has several functions in English, only one of which is to express past time. Another function is to express “modal remoteness”–i.e. unlikely possibilities or impossibilities. Each of those functions is shown in a light green square. (For every verb except one, the verb form in these two squares would be identical. I’ve chosen the one and only verb for which there’s a difference: be, with its was for the open conditional, and were for the remote one. And even that distinction has disappeared for many speakers, who uniformly use was in sentences like these.) When both functions are in play, then a “double past tense” does the job. I show this with the darker shade of green in the bottom right, with the if clause in the past perfect tense: If he had been sorry. This was not a publicity stunt. Of course, if I had known that all of this would happen, I would have done this years ago! I’ll say anything on a runway. I’d speak Hebrew or Arabic or Swahili if I knew them, anything to hedge my bets. But today I am too exhausted to bargain with God. We all know Julianne Moore is an Oscar-nominated, Emmy award-winning actress, but who knew that she liked to clean? If I knew that, I’d have given her Tuesdays at my house for a little light dusting. Extrapolating that last number to the 609 hits for “if I knew”, I estimate that there are 120 nonstandard past-time remote conditionals. Add to that the nearly 200 standard past-time remote conditionals in COCA, we have a total of about 320 past-time remote conditionals. Of them, about 38% use the simple past tense instead of the past perfect. Well short of Karl’s guess of 80%, but still pretty sizeable. And of course, the numbers for what he hears and reads may well be nearer to 80%. Also, when I narrowed the search to If I knew then and If I had known then, I get a total of 37, only eight of which use the standard past perfect tense. In other words, 78% of the tokens used the simple past, right in line with Karl’s guess. I wonder if the signaling of past time by then makes it less necessary for the verb to do so. I would never have given him the sweet if I knew there was acid in it. if I knew what I know now, I would never have left Pontypool. For if I had known, I got 18 hits. That makes two nonstandard conditionals out of 20, for 10%. So, to the extent that the older BNC data still reflects modern usage, and to the extent that my single example is representative of past-time remote conditionals more generally, Americans are almost four times as likely to use a simple past tense in them as British speakers. Feel free to run your own searches in COCA, BNC, or other corpora (maybe the Corpus of Historical American English) with other verbs. Let us know what you find. Karl, thanks for your suggestion! @LiteralMinded Dude, someone needs to tell that teacher that a statement does not imply its logical inverse. I nominate Doug. Is If I Would Have Ever Standard Grammar? In 1986, I couldn’t escape the song “If She Would Have Been Faithful” by Chicago. I hated it for three reasons. First, it was such a whiny, wimpy-sounding song. Of course, a lot of Chicago’s songs are like that, but second, I didn’t like the theme of this song: “I’m glad my old SO was unfaithful to me, because otherwise, I’d still be with her, and wouldn’t have met you.” I’ll admit, with so many hundreds of songs about love out there, unless you’re going to go farther afield and write about peanut butter, Adidas, or rocks to wind a piece of string around, it’s going to be difficult to find new things to say. Even so, the main thing I take away from this song is that the lyricists were trying too hard. And the third thing, the thing that topped it all off, was the nonstandard grammar in If she would have been faithful. However, over the years I’ve wondered exactly why If I would have should be nonstandard. Sure, If I had is a shorter alternative that still sounds natural, but why should that alone be enough to deny If I would have? Furthermore, you can even make a couple of positive arguments in its favor. Here’s one. We agree (don’t we?) that you express past-time counterfactuals with a past-perfect tense (i.e. the form with had plus past participle, e.g. had been). Furthermore, the past perfect tense of the modal verb would is would have. Therefore, if you can make a conditional referring to the present time such as If you would listen to me, we’d get along better, then you should also be able to make one referring to the past time, by putting the woulds into the past perfect: If you would have listened to me, we‘d have gotten along better. The second argument is based on analogy: You can use could have in if-clauses; for example, If I could have helped them, I would have. So why can’t you do the same thing with would have? These arguments are valid, and at various times during the history of English, ordinary past perfects and would have past perfects have both been in past-time counterfactual conditionals — in both the if-clause and the main clause! Right now, it happens that the ordinary past perfect has the if-clause in the standard language, and that’s why would have is unappreciated there. But in 100 years, the tables could have turned once again. Instead of If you had listened to me, we would have gotten along better, it might be If you would have listened to me, we had gotten along better. For more on the historical development of the past perfect tense in conditionals, as well as more information on the arguments in favor of “would have,” and an overview of what grammar books and linguists have had to say on this topic, I recommend this 2003 paper by Noriko Ishihara. Despite the validity of the above arguments, though, they still may not be enough to bestow legitimacy on most uses of would have in an if-clause. Consider the difference between If you would listen to me, we’d get along better, and If you listened to me, we’d get along better. For some speakers, these sentences mean the same thing, but for others, the version with would listen carries an idea of willingness—a vestige of the oldest meaning of will/would: to want or be willing to. If the meaning difference is too subtle with the verb listen, try it with the verb die. If you died tomorrow, who would take care of your family? is a grim but grammatically ordinary question. In contrast, If you would die tomorrow, who would take care of your family? sounds like something said by a non-native speaker. Following this reasoning, the clause if you would have listened to me shouldn’t mean completely the same thing as if you had listened to me, but something more like if you had been willing to listen to me. For that reason, many of the people who argue against if you would have (Glen, I’m looking at you) do it on the grounds that it should be reserved to mean if you had been willing to, and using it to mean just if you had erases a meaningful distinction. Finally, even if this “if you had been willing” meaning exists, it will most likely not occur to your audience. Even if you write “if you would have listened to me” and really do mean “if you had been willing to listen to me,” your audience will almost certainly interpret it with the same meaning as they would “if you had listened to me”. In that situation, you’d communicate your meaning better by just writing, “if you had been willing to listen to me”. If only we swam as good as we look! The day after tomorrow, I’ll have to make a choice that I haven’t been faced with for years: Which primary should I vote in? The last time my vote in either primary had a glimmer of a chance of making a difference was in 2000. That year, I registered myself as a Republican for the sole purpose of trying to keep George W. Bush off the November ballot by voting for John McCain. It didn’t work out so well. As your president, I promise to govern as a Reagan conservative. In the first alternative phrasing, the future tense will govern fixes things up, since even though McCain isn’t the president now, he’s talking about a future situation when he will be. You can call the assumption optimistic or presumptuous depending on your attitude toward McCain, but it doesn’t leave open the objection that he isn’t president. The next alternative phrasing is OK, too, with the conditional would govern. Of course, a campaign manager wouldn’t use this phrasing, since the conditional implies that McCain’s being elected is a remote possibility. The third alternative phrasing works because even though promise is in the present tense, we’ve fixed things up by modifying the noun president with next, acknowledging that he’s not president now. As for the assumption that he will be, refer back to the first alternative phrasing. 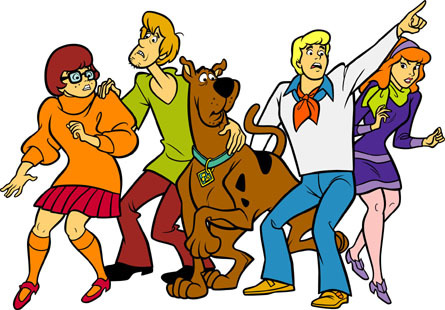 Who did John say that Sarah thought that Bill ordered [missing subject] to read the report? What did John say that Sarah thought that Bill ordered Jane to read [missing direct object]? And if we are on the wrong side when the votes are tallied, our agenda will be demolished and America will take a disastrous turn to the left–your taxes will skyrocket as our economy grinds to a halt; the federal government will expand into every nook and cranny of society; Senate Democrats will rubber stamp every radical left-wing judge Senator Clinton sends them for confirmation for the Supreme Court. Whoa! Now I’m not a Constitutional scholar, or even a serious Constitution buff like Glen or his friends Tom and DGM, but I am pretty confident that senators do not nominate judges for the Supreme Court. To make this sentence Constitutionally accurate, they need to say something like President Clinton or current Senator Clinton. Or maybe even President Obama.